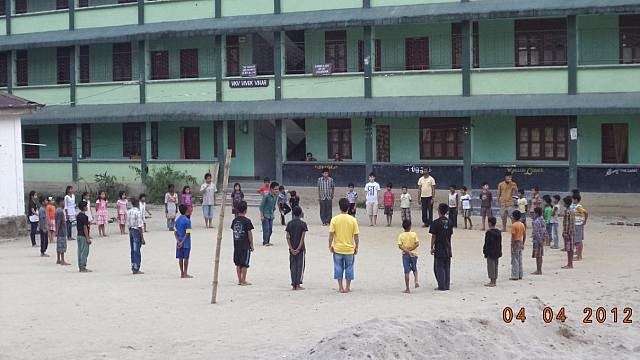 Vivekananda Kendra ArunJyoti, Itanagar Branch conducted ten days Moral value enhancement training camp specially designed for the students of Class IV to X on 11 to 20 April 2014 for the students of Capital Complex respectively in Vivekananda Kendra Vidyalaya, Chimpu, Police Colony Vivek Vihar, VKV Nirjuli & NERIST. The age old indigenous practice of valued Sanskar, which gives an individual, good moral character & ethics to lead a successful life & develop leadership personality of an Ideal human being .Keeping those view a non residential “Personality Development Camp”. Around 150 students comprising standard of class IV to X participated on 3pm to 6pm everyday scheduled camp duration lead by Vivekananda Kendra Arun Jyoti Itanagar Karyakarta Gai Bam, Anil Shrikandne, Kumari Yago Digio, Arjun Dodum including 13 Karyakarta conducted this camp. Through this Non Residential Personality Development Camp, selected Students will participate join the residential Personality Development Camp 21 to 25 April at Vivekananda Kendra Vidyalaya, Itanagar. Participants are motivate & inspired To lead on future with a positive direction and to inculcate patriotism, cultural value, self discipline and the attitude of Social Service, with the twin ideal of Vivekananda Kendra “Man Making - Nation Building” through the various sessions on yoga, patriotic songs, concentration & memory development games, storytelling like of patriotic personality.